We will always miss you, David. You had a wonderful laugh and an awesome personality. David and I attended Nettie Marshall together, and even in the 6th grade at TJR, when they mixed us all up, we somehow managed to be in the same class. So, I was privileged to be around David all day long from the 1st through the 6th grade. At Nettie Marshall, the teachers often sat us side by side 'because we got along so well'--an indication of David's easy-going manner and not mine for sure! He had the greatest laugh and always seemed happy, even in high school as he battled a brain tumor. My mother and his mother were friends, so I heard a lot about his fight with the disease and was always amazed when he would be at school after being in the hospital for days. He rode my grandfather's bus (#15) when they lived out in the country and my grandfather adored him. He visited him many times in the hospital and was broken- hearted when he died. Little did I know at the time, that I would lose my grandfather just a short year later after we lost David. 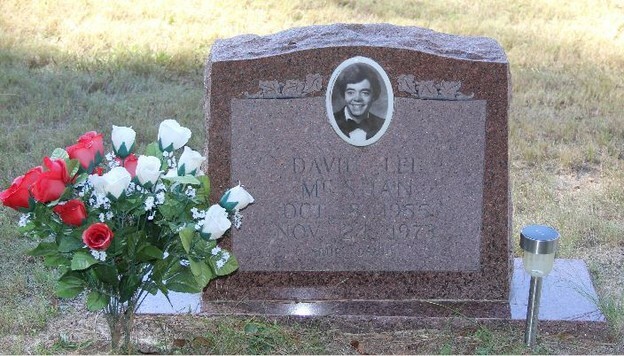 I'll never forget my mother telling me that David asked to be buried in his blue jeans. And they, of course, honored that wish. My eyes well up with tears even after all these years thinking of that sweet boy. It will be a joy to see him again one day. I will always remember David for his BIG smile and heart. David, Patricia, David from 2nd grade.